. Last edited 15:12 5 Nov 2018. Aggregate end-user gas demand was mixed across Europe in October. A combination of strong wind, hydro, and nuclear generation curbed gas demand y/y in Spain, Italy, and France, while gas-to-coal switching eased gas demand in the UK and Germany. 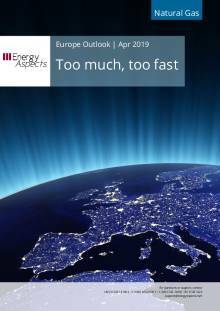 Only Belgium posted higher gas into power, owing to ongoing high nuclear outages. Pipeline supply was sluggish in most regions, but total supply was higher y/y owing to a substantial increase in LNG sendout, as a narrower JKM-TTF basis led Europe to post the largest y/y increase in port receipts since April 2011. 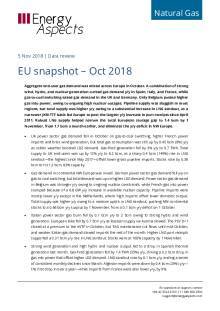 Robust LNG supply helped narrow the total European storage gap to 1.4 bcm by 1 November, from 1.7 bcm a month earlier, and eliminate the y/y deficit in NW Europe. UK power sector gas demand fell in October on gas-to-coal switching, higher French power imports and brisk wind generation, but total gas consumption was still up by 0.45 bcm (8%) y/y as colder weather boosted LDZ demand. Gas-fired generation fell by 3% y/y to 9.7 TWh. Total supply to UK end-users was up by 12% y/y to 6.2 bcm, as a sharp 0.4 bcm (149%) rise in LNG sendout—the highest since May 2017—offset lower gross pipeline imports. Stocks rose by 0.38 bcm to hit 1.2 bcm, 82% capacity. Gas demand in continental NW Europe was mixed. German power sector gas demand fell y/y on gas-to-coal switching, but total demand was up on higher LDZ demand. 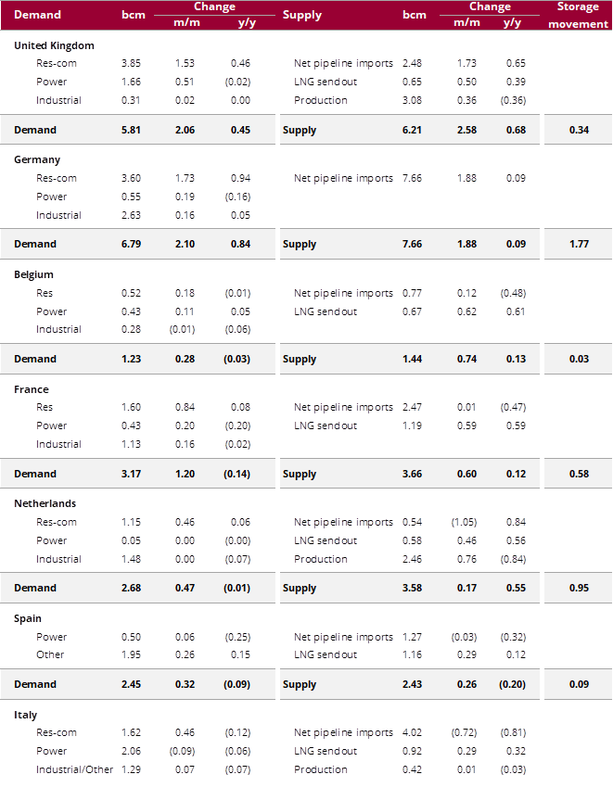 Power sector gas demand in Belgium was stronger y/y owing to ongoing nuclear constraints, while French gas into power slumped because of a 6.8 GW y/y increase in available nuclear capacity. Pipeline imports were mostly lower y/y except in the Netherlands, where high imports offset lower domestic output. Total supply was higher y/y owing to a massive uptick in LNG sendout, pushing NW continental stocks to a 0.66 bcm y/y surplus by 1 November, from a 0.1 bcm y/y deficit on 1 October. Italian power sector gas burn fell by 0.1 bcm y/y to 2 bcm owing to strong hydro and wind generation. European take fell by 0.7 bcm y/y as Russian supply via Austria slowed. The PSV D+1 closed at a premium to the AVTP in October, but TAG maintenance cut flows until mid-October, and weaker Italian gas demand slowed imports the rest of the month. Higher LNG port receipts supported a 0.31 bcm y/y rise in LNG sendout. Stocks were at 100% capacity by 1 November. Strong wind generation and high hydro and nuclear output led to a drop in Spanish thermal generation last month. Gas-fired generation fell by 1.4 TWh (35%) y/y, driving a 0.2 bcm drop in gas into power that offset higher LDZ demand. LNG sendout rose by 0.1 bcm y/y, ending a series of consistent monthly declines since March. Algerian imports were down by 0.4 bcm (25%) y/y—the first drop in over a year—while imports from France were also lower y/y, by 9%.